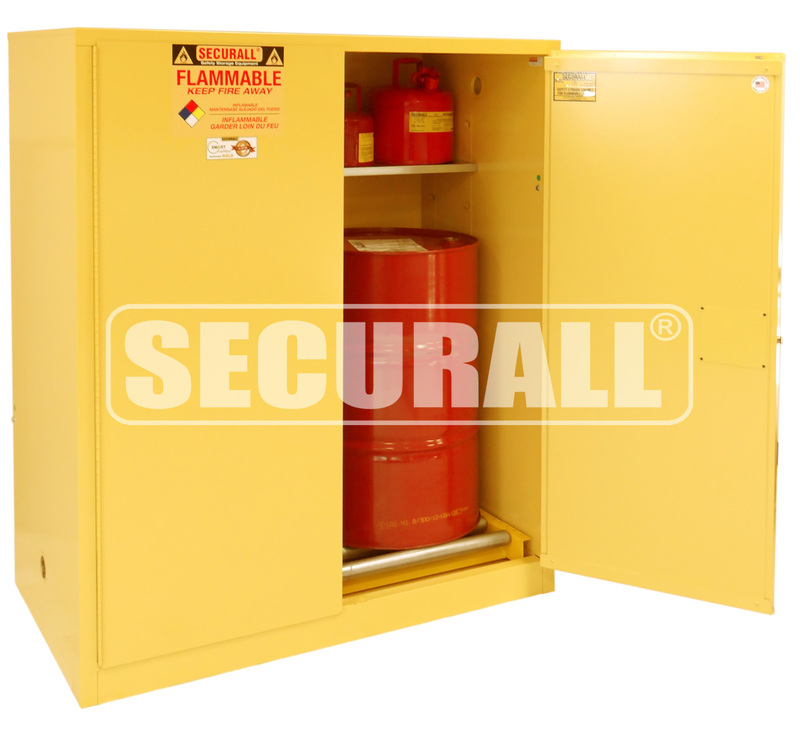 Securall manufactures cabinets for horizontal or vertical drum storage. Vertical Cabinets have ball bearing rollers for easy placing and removal of 55-gallon drums. Horizontal cabinets have tracks to guide Drum Cradle into position. 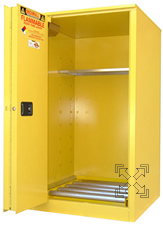 Safe, convenient and centralized storage for Flammables. Vertical Cabinets have ball bearing rollers for easy placing and removal of 55 gallon drums. 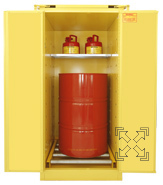 From one to twelve 5-gallon safety cans can also be stored depending on the model. Horizontal Cabinets store one 55 gallon drum and one 5 gallon safety can. Drum cradles available. Horizontal cabinets have tracks to guide Drum Cradle into position. Choose from 3 door styles. H160 - Self-Latch Standard 2 Door; Capacity 1-55 Gal. Drum & 1-5 Gal Safety Can; Dimension 50"H x 34"W x 50"D; Approx. Ship. Wt. 384 Lbs. H260 - Self-Close, Self-Latch Safety-T-Door; Capacity 1-55 Gal. Drum & 1-5 Gal Safety Can; Dimension 50"H x 34"W x 50"D; Approx. Ship. Wt. 389 Lbs. H360 - Self-Close, Self-Latch Safety-T-Door ; Capacity 1-55 Gal. Drum & 1-5 Gal Safety Can; Dimension 52"H x 34"W x 50"D; Approx. Ship. Wt. 414 Lbs. V160 - Self-Latch Standard 2-Door; Capacity 1-55 Gal. Drum & 2-5 Gal Safety Can; Shelves 1; Dimension 65"H x 31"W x 31"D; Approx. Ship. Wt. 382 Lbs. V260 - Self-Close, Self-Latch Sliding; Capacity 1-55 Gal. Drum & 2-5 Gal Safety Can; Shelves 1; Dimension 65"H x 34"W x 34"D; Approx. Ship. Wt. 400 Lbs. 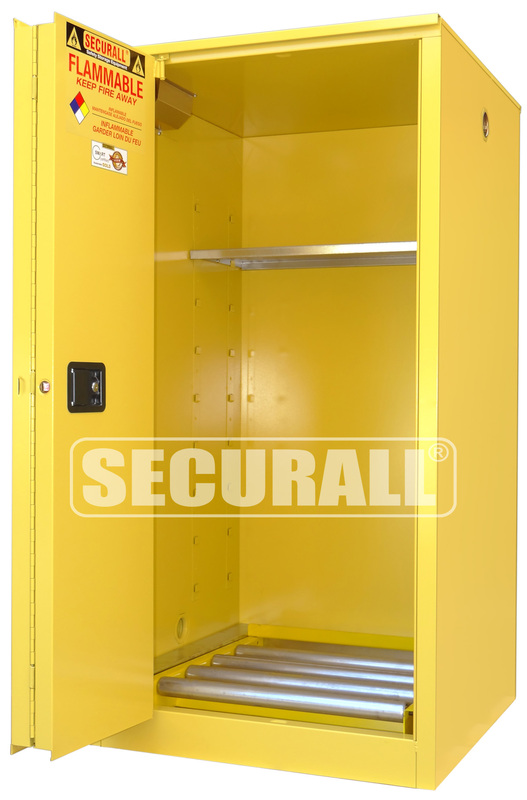 V360 - Self-Close, Self-Latch Safety-T-Door; Capacity 1-55 Gal. Drum & 2-5 Gal Safety Can; Shelves 1; Dimension 67"H x 31"W x 31"D; Approx. Ship. Wt. 404 Lbs. V175 - Self-Latch Standard 2-Door; Capacity 2-30 Gal. Drum & 3-5 Gal Safety Can; Shelves 1; Dimension 65"H x 43"W x 31"D; Approx. Ship. Wt. 419 Lbs. V275 - Self-Close, Self-Latch Sliding; Capacity 2-30 Gal. Drum & 3-5 Gal Safety Can; Shelves 1; Dimension 65"H x 43"W x 31"D; Approx. Ship. Wt. 424 Lbs. 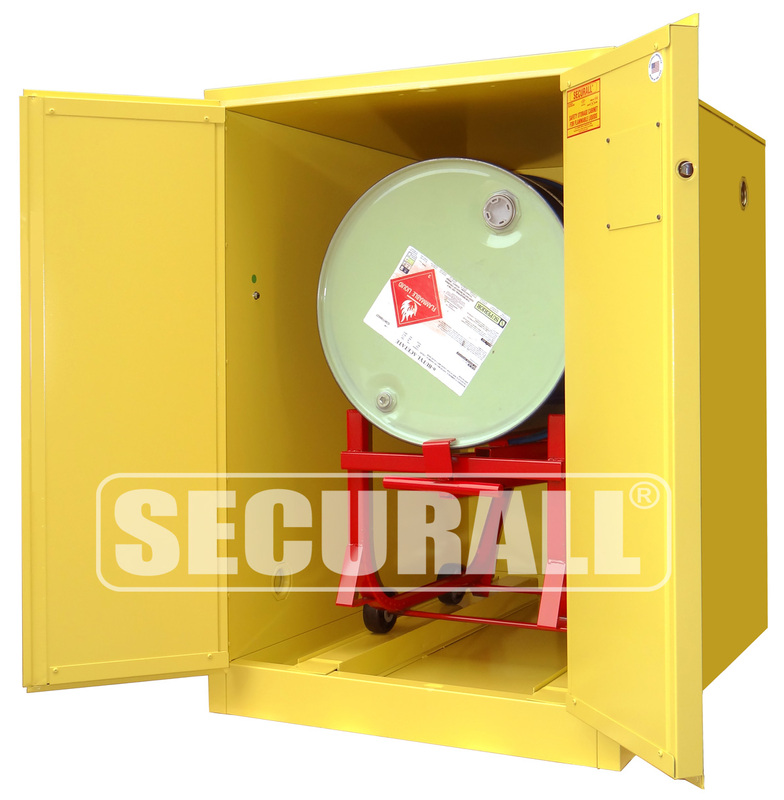 V375 - Self-Close, Self-Latch Safety-T-Door; Capacity 2-30 Gal. Drum & 3-5 Gal Safety Can; Shelves 1; Dimension 67"H x 43"W x 31"D; Approx. Ship. Wt. 448 Lbs. V1110 - Self-Latch Standard 2-Door; Capacity 2-55 Gal. 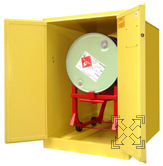 Drum & 2-5 Gal Safety Cans; Shelves 1; Dimension 65"H x 56"W x 31"D; Approx. Ship. Wt. 581 Lbs. V3110 - Self-Close, Self-Latch Safety-T-Door; Capacity 2-55 Gal. Drum & 2-5 Gal Safety Cans; Shelves 1; Dimension 67"H x 56"W x 31"D; Approx. Ship. Wt. 610 Lbs. V1500 - Self-Latch Standard 2-Door; Capacity 1-55 Gal. 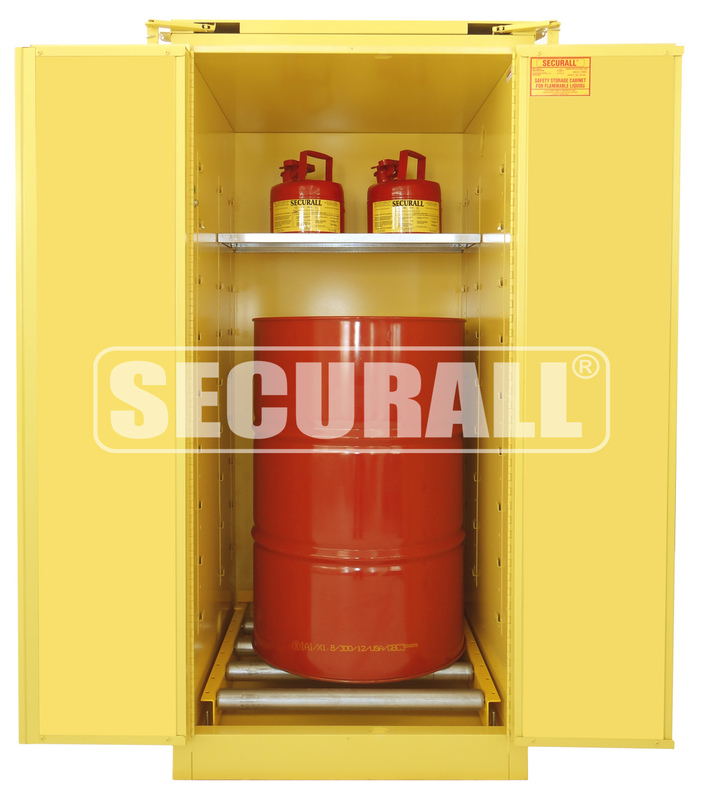 Drum & 12-5 Gal Safety Cans; Shelves 3; Dimension 65"H x 56"W x 31"D; Approx. Ship. Wt. 600 Lbs.